Three species of skink have been recorded in or within 60 km of Abu Dhabi. Two live in sand dune areas and one tends to reside in gardens and other cultivated areas. All have conical heads, pointed snouts, small eyes, cylindrical bodies, tapering tails, and very short legs. All are extremely fast and have the capability of literally disappearing vertically into the sand. They can often be retrieved by immediately plunging one's hands into the sand at the point where they disappeared and (hopefully) scooping up the creature. This has a light fawn or sandy color on top with a white or pale cream underside. There are no side bars on the body, and the ear opening is visible. The toes are fringed with pointed scales. This species lives in sand dunes and grows to 15cm. This species is very dark brown with white spots in transverse black lines, though the underside is white. It tends to be quite slender, and is without the toe fringes typical of the other two species. 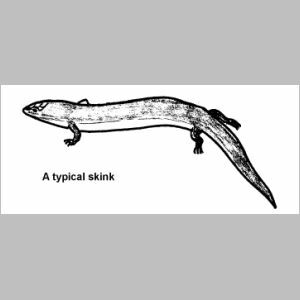 This skink inhabits cultivated areas and grows to 20cm. This is darker above, being orange brown in color, but is similarly white beneath. There are several dark brown or reddish vertical bars on the sides of the body, and the ear opening is not obvious. It also has pointed scales on its toe fringes. It also lives in sandy areas and grows to a maximum 20cm.